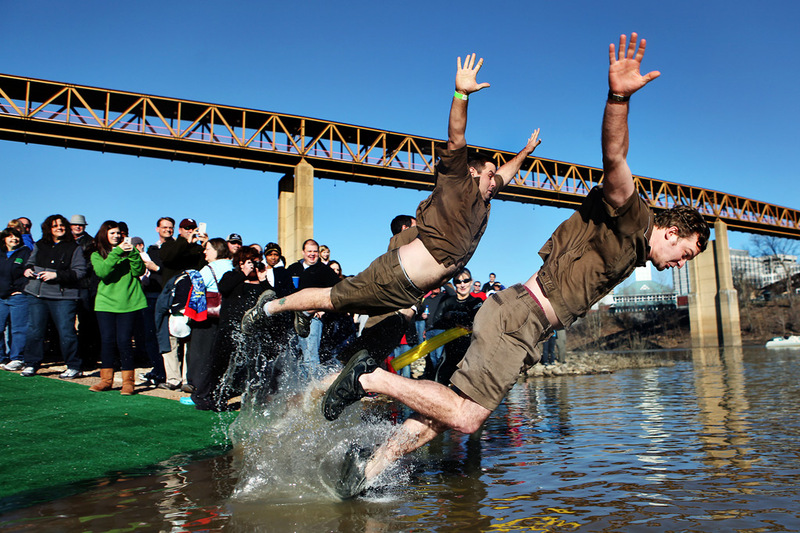 (Above) Jason Benson and Wes Bennett dive into the 34°F Wolf River, dressed as UPS delivery workers, while participating in the 14th Annual Polar Bear Plunge and Chili Cook-off at Mud Island River Park. (Below) Dressed as a polar bear, Ben Sumner, a Special Olympics athlete, receives a helping hand from a lifeguard after jumping into the Wolf River. The Polar Bear Plunge and Chili Cook-off raises support for the Special Olympics of Greater Memphis.